In yesterday's post I mentioned Charly's Bakery, and how you should definitely not look at their cupcake gallery page. 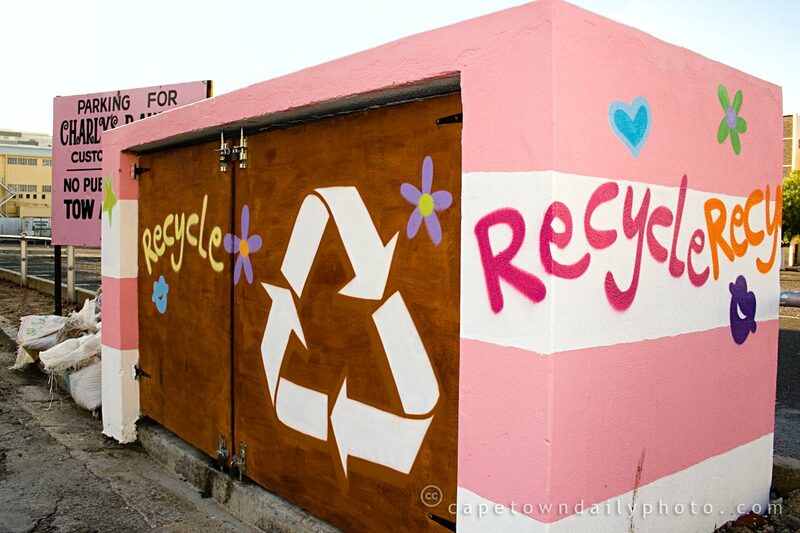 Today's photo (as you may notice) is of a "recycling station" found on the corner of their premises... and this got me wondering about the recycling project that started in Cape Town a while back. On Tuesday mornings I roll my large, black, dirtbin out onto the curb. A little while later a huge truck comes past to collect the contents. Unlike many other cities however, we don't have a convenient way of disposing of recyclable (or environmentally-damaging) waste. To recycle our waste we have to separate bottles, paper, and plastics into separate containers. Once the containers are full we then have to deliver the contents to a local collection point... which is far too inconvenient for most. To assist with this (and to reduce the impact on our environment) the City of Cape Town entered into a partnership with a company called Waste Plan a while back. Under the arrangement, residents are provided with special plastic bags into which recyclable waste should be separated. The full bags are placed into the municipal bins (the same one that I wheel out on Tuesdays) and Waste Plan collects the contents for recycling. Unfortunately this arrangement hasn't yet extended into our suburb, but we're hoping that it soon will! Posted in Street photography and tagged art, environment on Sunday, 3 May, 2009 by Paul. I wish the city would get going on a proper plan. They could start by making more recycling depots/containers available at convenient locations, surely?